I am once again faced with what I will share in this article. Sometimes the subject jumps up and hits me square in the face, while at other times I wonder if I’ve hit the mark. I do hope and pray that at some time that what I have written has touched your heart. Tonight is a time where after meditating on what to share, God has impressed on me something that I needed to hear and hopefully will help you as well. So, for just a few moments, allow yourself the opportunity to quietly listen to the words as they share the message God has for you. As this article began to take form in my mind, I realized that what I share is simply something that I have encountered, yet what God does with it in your life becomes truth in yours. Jesus was the Master storyteller using parables to teach His disciples. Parables have been defined as earthly stories with heavenly meanings. Jesus explains the truths contained in many of them as He taught. This statement was a fulfillment of prophecy from Isaiah 42:19-20. The people were unable to hear because their hearts had become dull and they were unable to receive the truths which Jesus was sharing. They could see Jesus, but did not believe in Him. They heard His teachings, but did not hear what He said; understanding was not possible for them. Then in Matthew 13:16-17 Jesus says, “But blessed are your eyes, because they see; and your ears, because they hear. For truly I say to you, that many prophets and righteous men desired to see what you see, and did not see it; and to hear what you hear, and did not hear it.” (Mt. 13:16-17) What an affirmation in the lives of the disciples! They had opportunity to hear the truths of God shared by the very Son of God. As I thought about the truth of this for my life, I was in awe. Because of my relationship with the Son, the Father through Holy Spirit reveals the very depths of His Word to me. Through hearing I came to know Christ as my Savior (note Rom. 10:14). Through study, I came to know more of the truth found in Scripture (see 2 Tim. 3:16-17) of how to live my life. Unfortunately, I have a problem called sin. It is a battle I face each day on varied fronts. The battle rages as the deceiver seeks to make my eyes cloudy and my ears dull. Sin sometimes keeps me from hearing the voice of Christ clearly as I move through the day. Yet, I’m so thankful that the voice, which called me into a love relationship with Him, speaks deep within my heart and calls me once again to Himself. The voice of the Shepherd continues to call out to His sheep, and His sheep will hear His voice and will not be drawn away. True, one can find themselves struggling in the path of life, but by listening once again to the voice of the Shepherd can find their way home. I am not alone in this journey. It’s possible that because of sin today you have struggled with hearing the voice of Jesus speaking to your heart. If so, let Him hear your voice rise in repentant prayer. As He does, you will find forgiveness from that which has caused you to go astray and you will hear a voice that will lead you home. It seems to me that God’s promise to us is that He will speak to us in the midst of our lives. As He speaks, those who know Him as Savior and Lord will hear His voice and know within themselves that His words are true. Is He speaking to you? 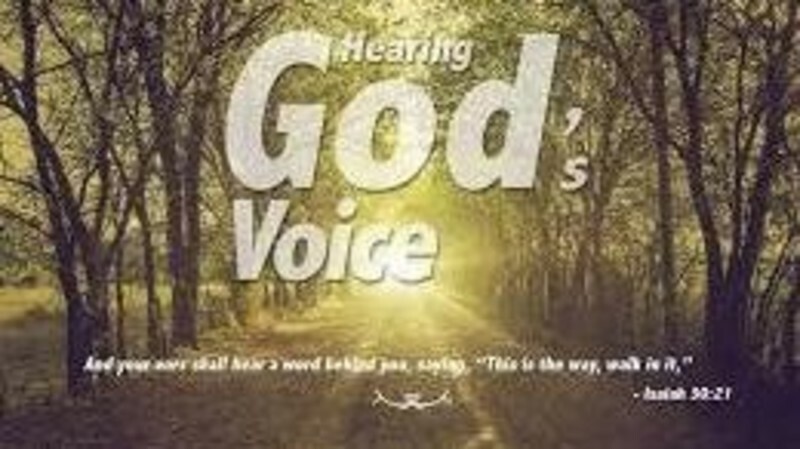 Listen for His voice today.